How is Valley Subaru of Longmont dedicated locally to the Love Promise? 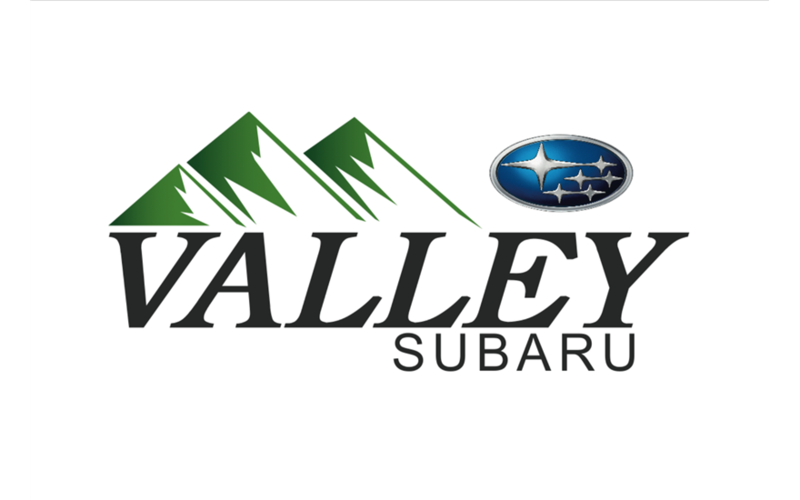 Did Valley Subaru of Longmont go above and beyond, provide exceptional service, or support causes that are important to you? We'd love to hear about it. 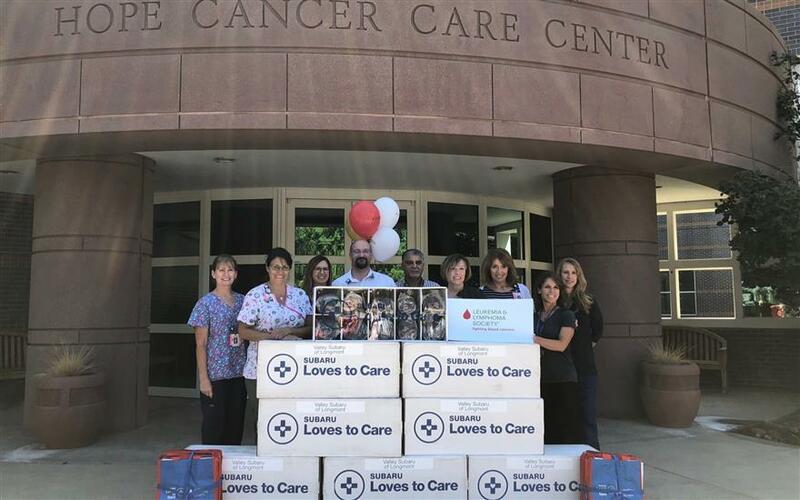 Partnered with The Leukemia & Lymphoma Society, Valley Subaru of Longmont delivered blankets to Longmont United Hospital’s Hope Cancer Care Center on July 13, 2018. Although Valley Subaru is heavily involved in their community, this partnership holds a special place in their hearts.Chelsea Mack, a Subaru representative, described a story from a couple of years ago in which a patient reached out to the General Manager of Valley Subaru directly to tell her about how much the blanket meant to her. The blanket supported her while going through treatment, and she was touched that Subaru made this commitment to the cancer community. Winters in Colorado can be very unpredictable and I am never afraid in hazardous conditions in my Crosstrek. The ability to turn off AWD is very handy in certain conditions like when you get stuck. I've never had that problem though. Paddle shifters aren't just for fun either. Slowing down by switching to manual, in icy conditions, allows you to lay off the brake. 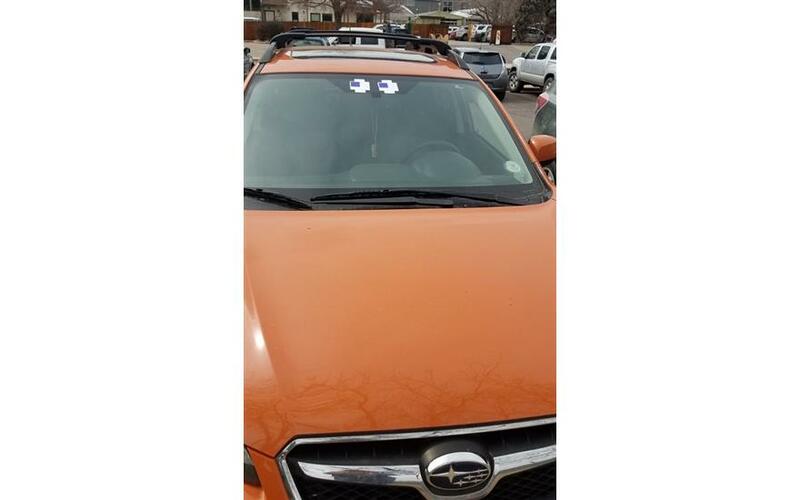 I love my Subaru and purchasing it and maintaining it has been a breeze because of Valley Subaru. I named mine Clyde. Maybe you can guess why from the picture. Had a great time with Valley Subaru of Longmont! We partnered with them for the #SubaruLovesTheEarth campaign, for donated gardening equipment and food, shelter and water sources for various small species. This new setup will make the school a certified wildlife habitat through the National Wildlife Federation and give us a great tool to teach the kids about the importance wildlife preservation and gardening! 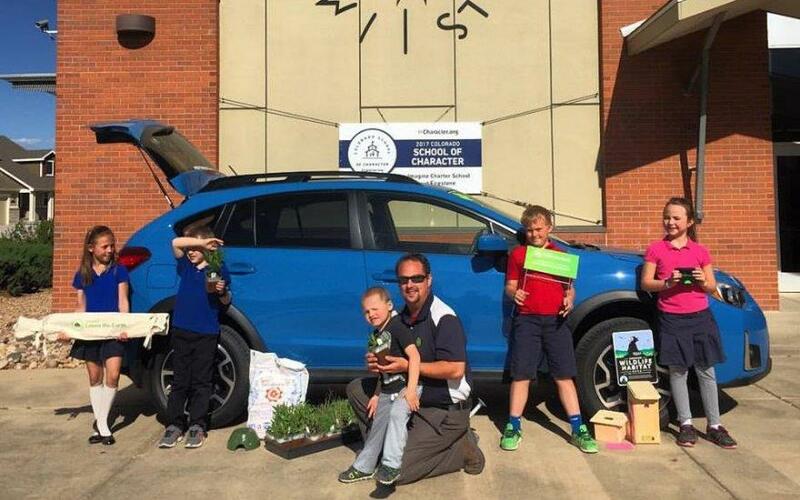 Valley Subaru of Longmont is bringing our commitment to the environment to life, by supporting the National Wildlife Federation (NWF). We know that loving the environment means more than loving the great outdoors, it means working to preserve it. Through our Subaru Loves the Earth initiative, we are supporting the Butterfly Heroes program and building habitats across the country. Did you know that 90% of Monarch butterflies have disappeared because their habitat is disappearing? We're working to fix that by providing a NWF certified wildlife habitat that supplies food, water, cover and places for butterflies to raise their young! This habitat will be on display at Valley Subaru of Longmont through the months of April and May and will then be donated to a local school. Why are the butterflies so important? Yes, they are beautiful to look at, but we need them to help pollenate our food. 1 of 3 bites on our dinner plate is made possible by pollinators. 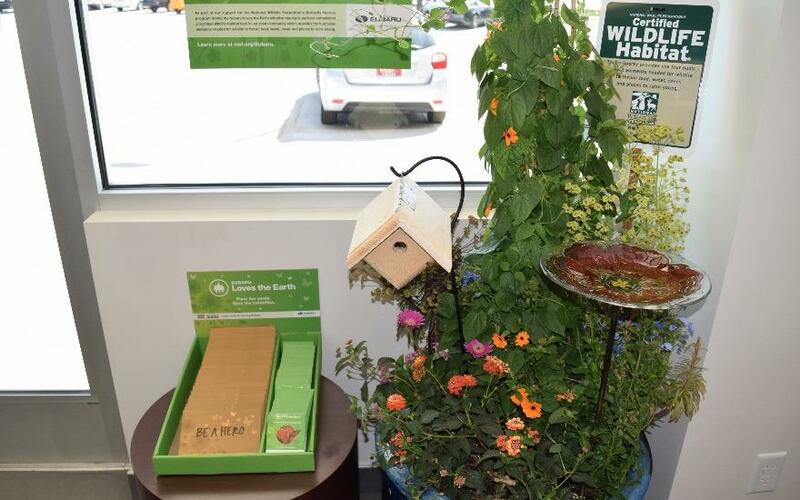 They're an important part of our ecosystem, and introducing habitats like the one we have at Valley Subaru plays an vital role in increasing butterfly populations.Come by Valley Subaru this month to see the NWF certified habitat and get your free packet of milkweed seeds! By planting these seeds, you'll be providing the food and cover the Monarch butterflies need to thrive. Join us in creating a community of Butterfly Heroes! When it comes to lifesaving partnerships, Valley Subaru/Nissan just gets it. Consistently first to step to the plate in supporting countless fundraising initiatives for Longmont Humane Society (LHS), it's clear to see that Valley's people treasure the human/animal bond, and are committed to seeing more pets find forever homes. Whether they're sponsoring Homeward Bound - the spring auction event or the Paws in the Park 5K Walk/Run & Festival, the entire team rallies in amazing ways to ensure LHS' success. They partner with LHS for the PAWS giving events, Holiday Pet & Family Photos, and the Holiday Giving Tree fundraiser - all in the hopes of giving a voice to those who cannot speak for themselves. 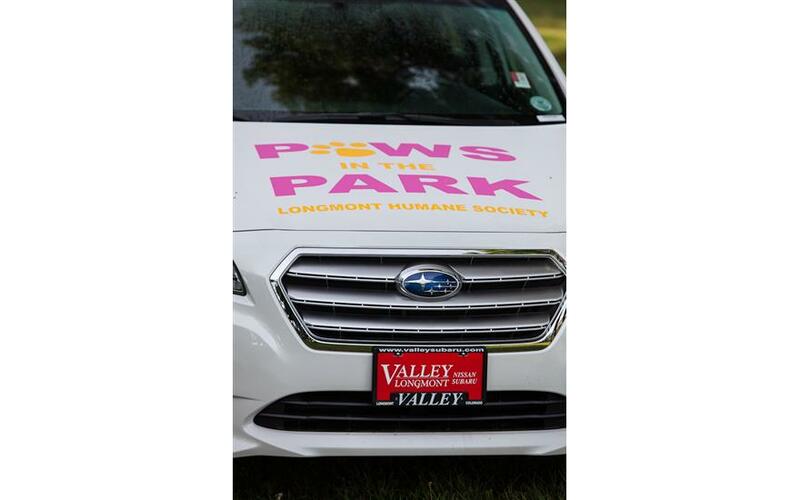 Valley's employees attend the events, contribute financially to LHS, welcome us into the dealerships for various functions, and have even opened their hearts and homes by adopting from LHS themselves. 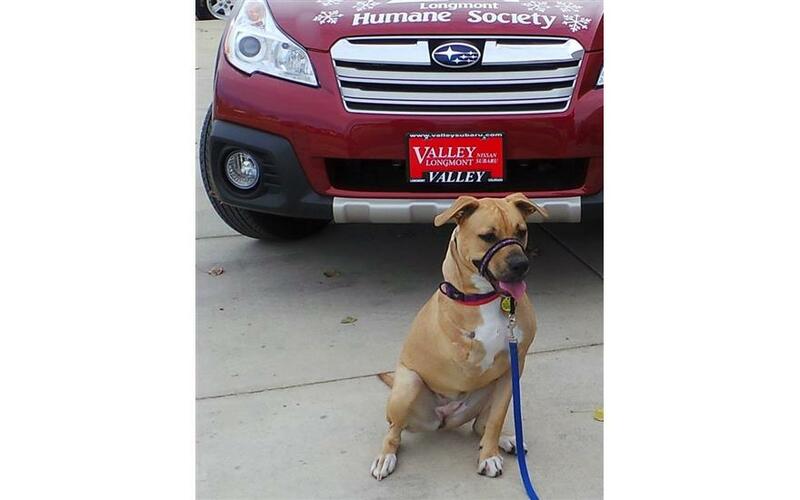 LHS is deeply grateful for our ongoing partnership with Valley Nissan/Subaru, which has and continues to provide second chances for animals in need. 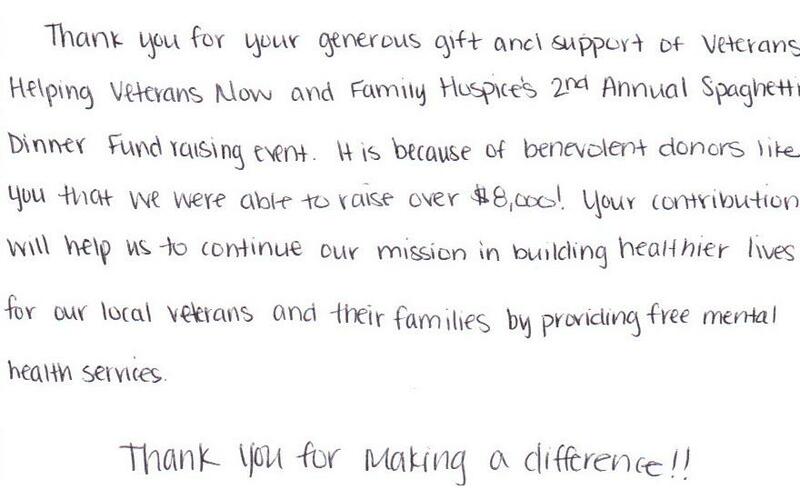 Veterans Helping Veterans Now is a wonderful organization that offers support for the veterans in our community. Valley Subaru is aware of the challenges that veterans face every day and we were proud to support this organization's annual Spaghetti Dinner that raised over $8,000! 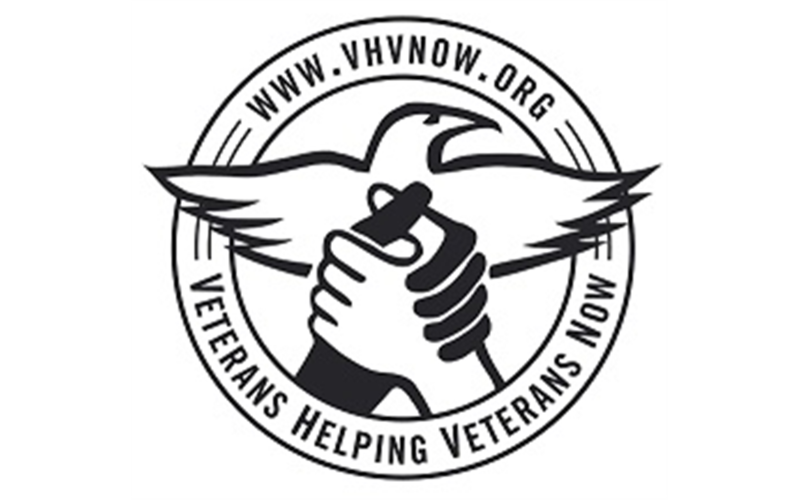 The funds raised will help VHVnow continue their mission to build healthier loves for local veterans and their families by providing free mental health services, support groups, educational opportunities and other forms of continued support. The Longmont Humane Society is one of our favorite organizations to work with! Valley Subaru gets involved with pretty much every event or fundraiser LHS holds because we admire what they do for the homeless animals in our community. They care for the animals in need of a home here in Longmont, but they also take in countless pit bulls from Denver that would otherwise be put down due to the city's ban on the breed. We've been proud to support everything they do including Holiday Pet Photos, Paws in the Park 5k, the Homeward Bound Benefit, and Holiday Giving Trees right here at the dealership. Outside of these events, we've also had Valley Subaru employees adopt their pets from LHS! We're so grateful for this partnership that has not only helped LHS raise funds to care for the animals, but also brought new furry, loving members to our employees' families! 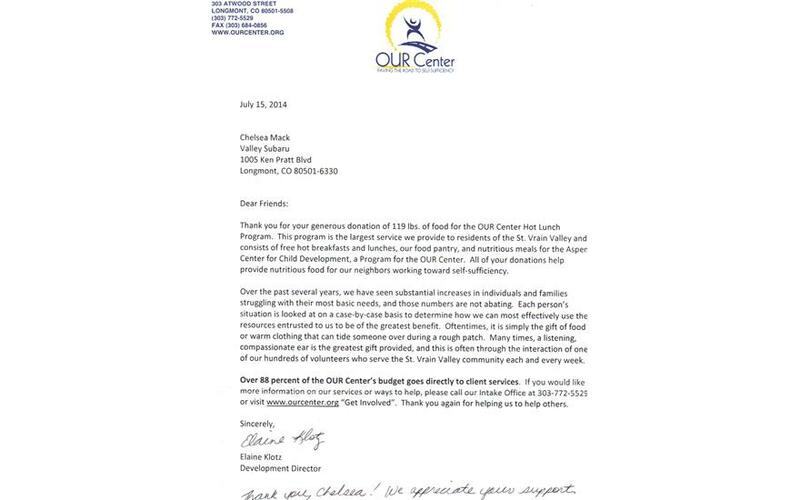 Valley Subaru loves the OUR Center in Longmont for their tireless efforts to help individuals and families who are struggling with their most basic needs. They offer everything from food and clothing to rental assistance, transportation and advocacy for those with disabilities. We started by simply holding food drives and delivering donations to the OUR Center. Most recently, we chose them as our hometown charity during Share the Love. We're thrilled to support this amazing organization and look forward to a continued partnership that will benefit our community for years to come!